New York City, March 1, 2013 | The women who work with Pittsburgh-based art psychotherapist Lauren Lazar Stern, MA, ATR-BC, LPC and NYC-based prescriptive artist Nancy Gershman all suffer from a range of eating disorders which numb them from feeling hurt, conflicted, or anything at all. There are the over-eaters; the bingers or binge-purgers; the restrictors; extreme dieters and over-exercisers. Only one thing takes precedence over boyfriends, husbands, jobs, friends, hobbies and studies: their primary relationship with “Ed" (their eating disorder). In the exhibit "Brides of Ed: An Integrated Approach" opening March 18, Stern and Gershman introduce their pioneering approach for helping patients divorce the eating disorder part of themselves and reclaim what they loved before Ed. Stern’s techniques come first, with expressive arts exercises. On display next are the tools used during the visual, auditory and tactile processing of EMDR. The third portion features the Healing Dreamscapes co-created with Stern's patients, along with patient testimony. For each prescriptive photomontage, Gershman combs for the patient's wishful reality, creating visualizations of a past or a future with happier outcomes. "The sensory imagery, symbols, metaphors and narrative elements," says Gershman, "trigger the brain to retrieve a memory, re-encode it and thus, transform it." These tangible objects of hope act as surrogate reinforcers in Stern’s absence and a reminder that there is life after Ed. 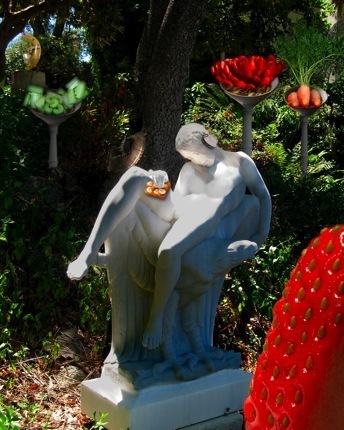 Nancy Gershman is a New York-based digital artist specializing in prescriptive photomontage to counter loss and regrets. Her work has appeared in Annals of American Psychotherapy; Robert Neimeyer's “Techniques of Grief Therapy,” and the Loyola University Museum of Art. Lauren Lazar Stern, MA-ATR-BC, LPC is a Pittsburgh-based art psychotherapist and EMDR therapist working with girls and women suffering from eating disorders and body image disturbance. She is the author of The Slender Trap: A Food and Body Workbook.